Julie Tremblay is a young, talented Canadian artist who was born in Quebec City in 1972 and currently resides in Copenhagen. 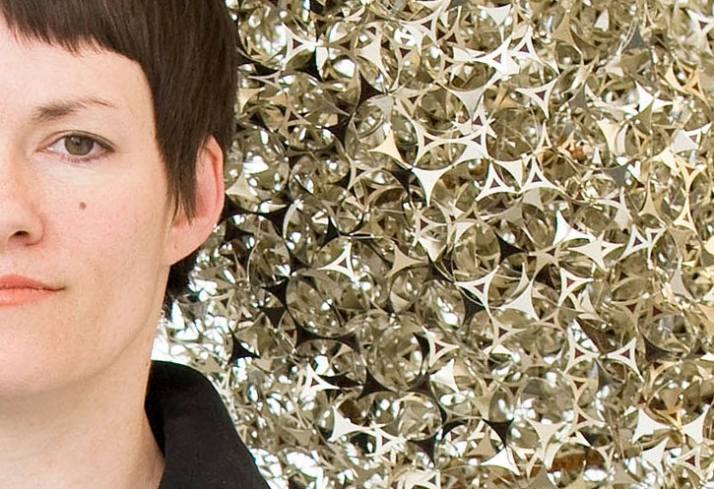 Tremblay has found in sculpture her true vocation. 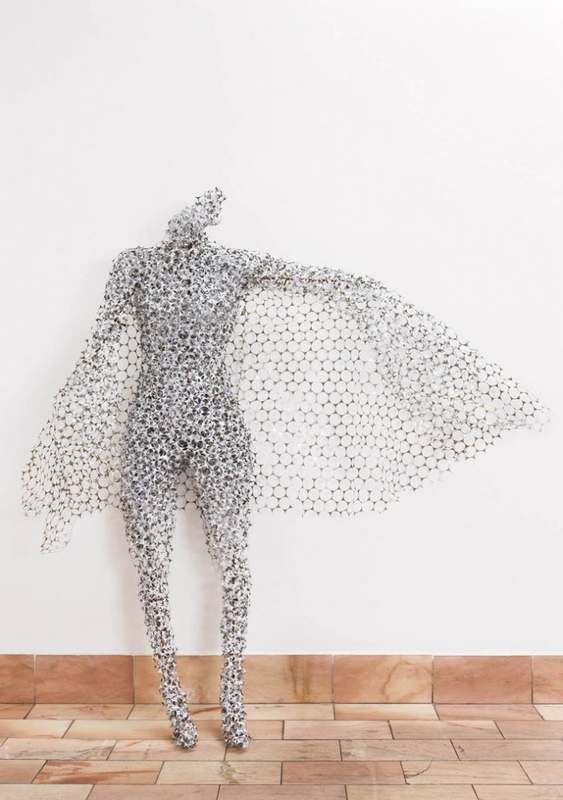 Her floating figures raise questions upon space, mortality, body perception, power and sensibility. Under an open dialogue, they possess an intriguing symbolism and transmit an almost mystical sense. 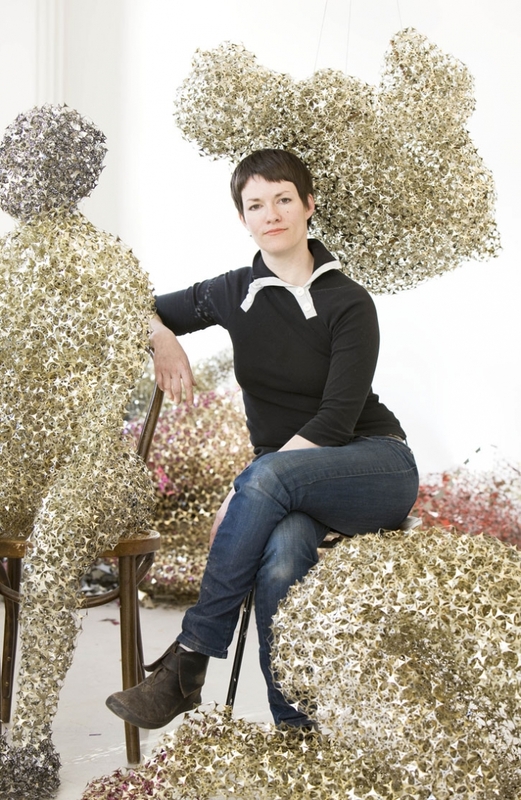 Tremblay’s airy sculptures are made out of hundreds of metallic pieces, in a type of artistic recycle. Their transparency and the way they reflect light make them seem to be under a constant movement. They occupy space but at he same time they create it. Transmitting certain loneliness, they give you the impression that they are prisoned in transparent cocoons, waiting with eager to be transformed into butterflies. We came in touch with Tremblay and tried to discover the mystery hidden behind her haunting creations. She kindly enlightened us in an interview exclusively for Yatzer! I knew already from a very young age that I wanted to be an artist of some kind. I was interested in many forms of expression including theater and the writing of poetry and short stories. I also loved to draw and my interest for drawing made me go to art school. I was very fortunate to have many inspirational teachers and got to explore and make work in many different mediums. I was really into photography at some point and concentrated on it for a while until I realized that I really missed making things and playing with materials and objects. From then on sculpture became my medium of choice. 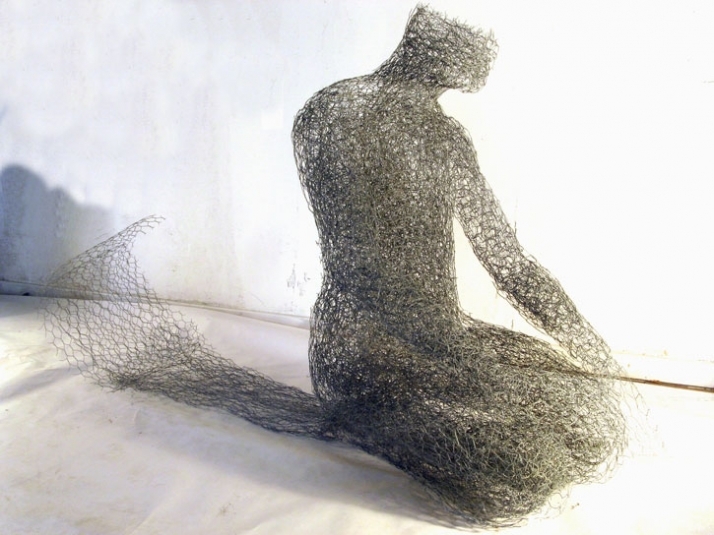 Which is the creative process behind your sculptures? Do you base them on previous drawings or is it all about work in situ? I rarely transfer my ideas into drawing. But once in a while I get the urge to do so, mostly if I get an idea that is better captured in a drawing then in writing or modeling. Sometimes I make a small clay study of the figure I want to make and I write down the ideas and thoughts behind it. It is, as a matter of fact, quite rare that a sculpture ends up looking like the image I had in my head as a starting point. I like my process to be an organic one, where there is a constant dialogue between the material, the form in the making and myself. I like that, to a certain extent, the form dictates the shape it is taking as I am making it. And sometimes, unexpected things happen, because I am open to letting them happen and that can be very exciting. Which are the materials you are currently using and why? How did you pass from wax to metal? Currently I am working with scrap metal, the leftovers from metal sheets that have been used to make bottle caps as well as chicken wire. They have similar qualities in that, I can make, with both materials, forms that are not only transparent, but where the inside is as interesting as the outside. I always loved playing, experimenting and working with different materials. I guess one could say that I am a true materialist ;-) To me, the material is an integral part of the work, it is a signifier. If the Reflections series had been made out of wax, the work would have then tackled different ideas. It wouldn’t have been so much of a reflection about the inside and the outside, about positive and negative space, fullness and emptiness, for example. I am always on the lookout for new and interesting materials, materials that give me something to think about. I stumbled upon the scrap metal I am working with by coincidence. I picked up a few sheets and brought them to the studio. I just loved how they reflected light. The metal sat in a corner of my studio for some months before I started manipulating it to see what I could do with it. 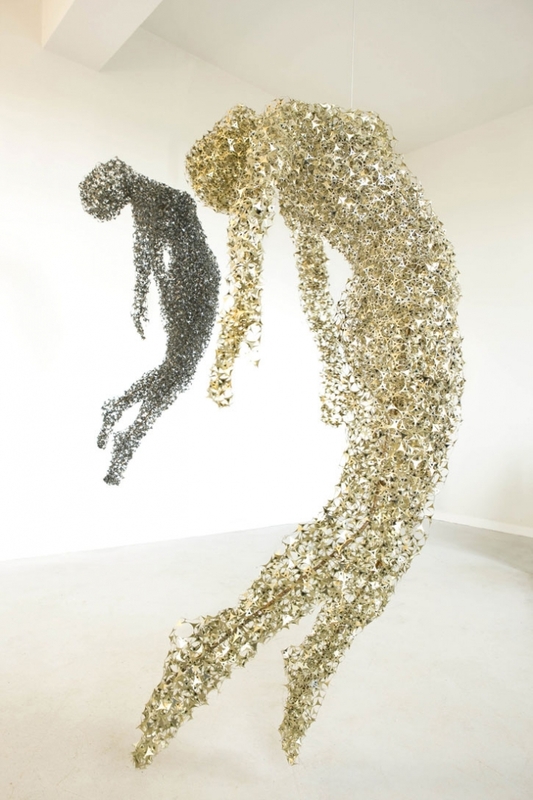 How do you achieve that your ethereal sculptures reflect lightness while made out of materials like metal? What does this paradox reflect? Because of the nature of the material (both with the scrap metal and the chicken wire) I am able to control the density inside the forms and since they are transparent, one can see through them. 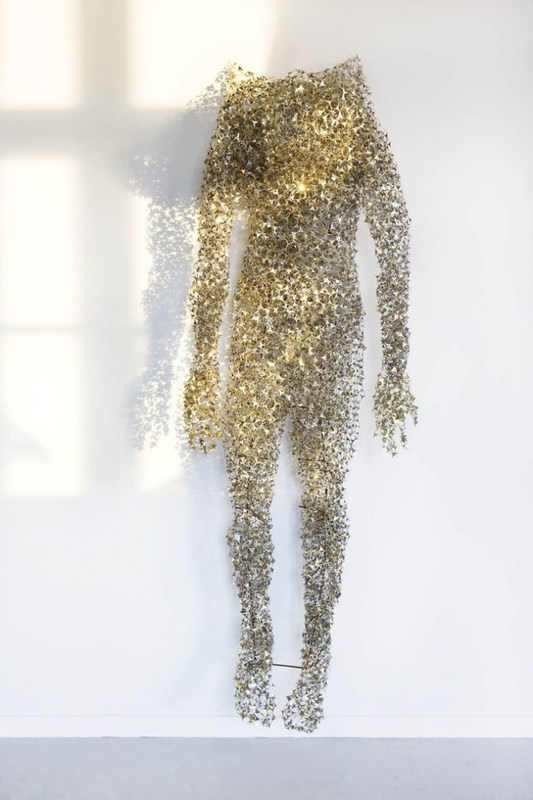 The space is contained inside of them and becomes a part of the sculpture. One could say that the sculptures are made out of metal but if someone else said they were made out of air, he or she would also be right. 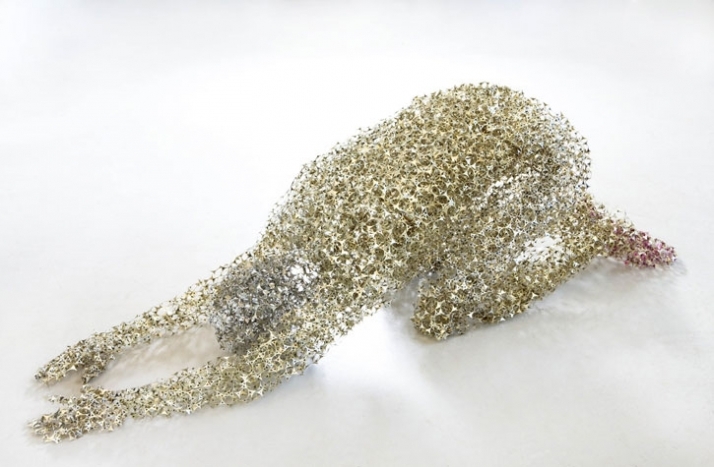 It is in fact a very interesting paradox that metal sculptures get to be so ethereal and a reflection of lightness. I like how it can make one see metal in a different way. 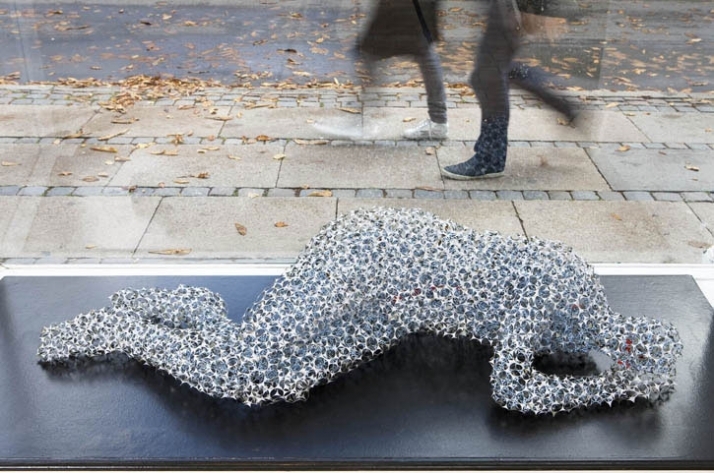 Rebecca Kormind, my gallerist in Copenhagen, said that on a few occasions, during my last exhibition there, people walked into the gallery and thought the sculptures were made out of paper! Metal in sculpture has always followed a tradition of heaviness; think bronze, think Richard Serra. The scrap metal I work with is very shinny and working with it is also working with light. It simply and literally presents metal under an entirely different light! You have quoted that you slightly transform the human body in order to become a metaphor. Can you tell us more about it? I do this different ways and I don't do it always. Sometimes it's by distorting proportions and sometimes it's by making a figure in a position that is in reality impossible. My work is not about realism although it is important that the figure may be recognized as such, and it must look right. The representation is for me a mean, not an end. I am hoping that, when people look at the sculptures and discover those anomalies, it makes them question why it is such that the head is incomplete and legs so thin? In doing so I am trying to bring the spectator into a symbolic universe where the human body is used as a metaphor for an idea. But at the same time I don’t want my work to be didactic and so it is also important that the sculptures remain mysterious and intriguing. They ask more questions then they answer I think. 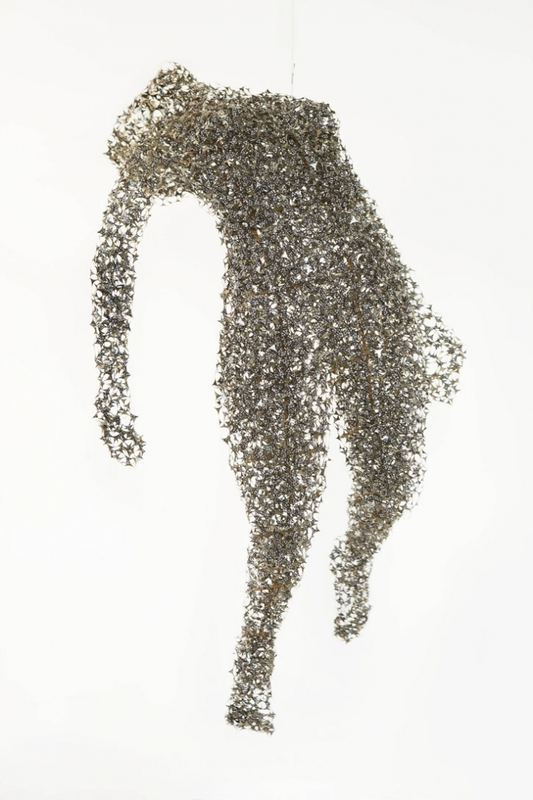 Some of your sculptures are on a constant movement as they hung out of disco ball motors. How does it influence the spectator’s perception of your pieces? It involves movement and time. 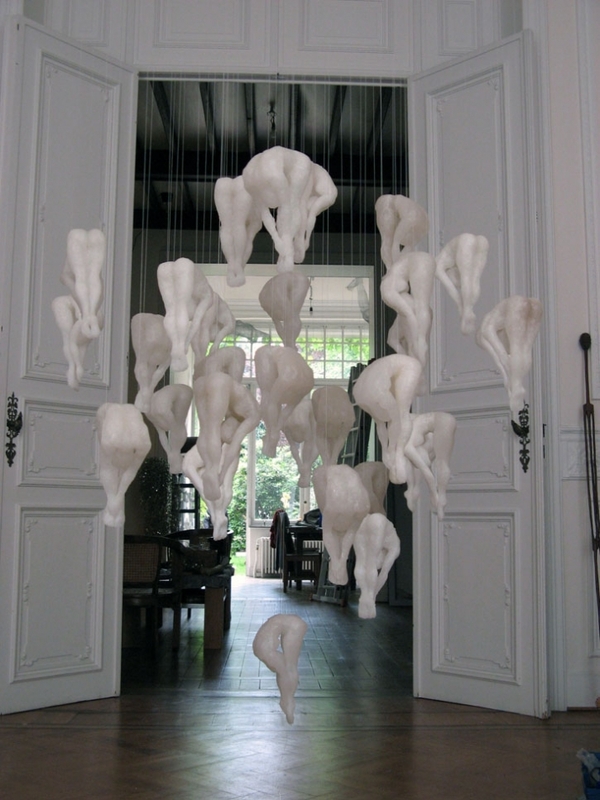 Together, the sculptures in motion form a whole that is in constant transformation. It creates a choreography of sorts. 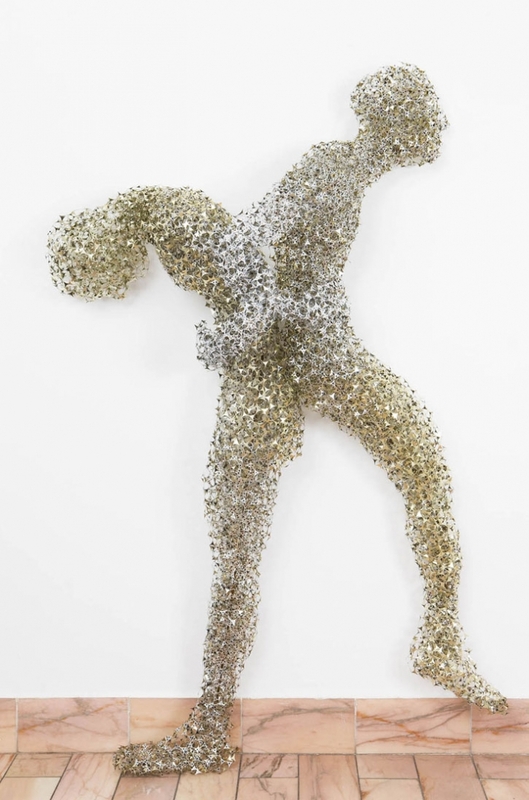 It is also playing with the idea that traditionally, when a spectator looked at sculptures, he or she had to walk around it to see it from all angles. In this case, the sculpture is doing the work. It is also a bit of a comment, or reflection rather, on the culture of entertainment. Which are your inspirations and in which way they are present at your work? Which are your future plans? I am working on a number of projects at the moment. Among other things, I am working on a collaboration with Swedish artist Fredrik Auster on an installation and performance that will, if all goes well, be presented in an old industrial building in Copenhagen in September and I am talking with a gallery in London about doing something there and I will be participating in a group exhibition in New York in June. 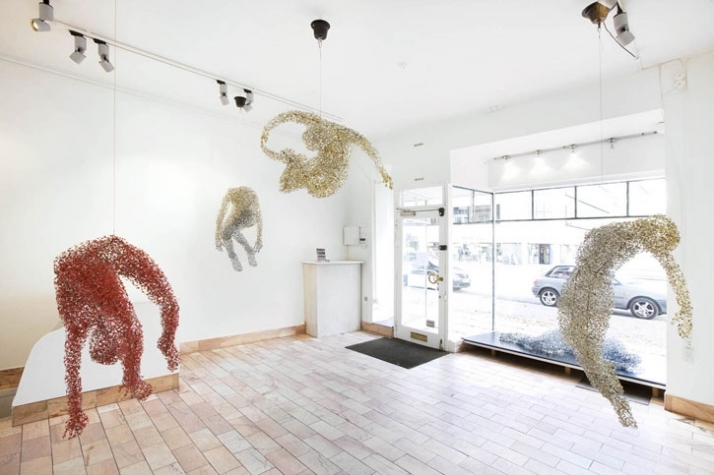 As for longer term plans, I am hoping to get the opportunity to work on large scale installations that would basically just be an expansion on the work I have been doing the past 10 years.